1 of 1 Coat slow cooker with nonstick cooking spray. Add 2 cleaned and sliced leeks, 2 medium peeled and sliced carrots, 1 diced celery rib and 1 lb peeled and diced russet potatoes. Stir in 2 cups milk, 2 cups 1/3 less sodium vegetable broth, 1 tsp 30% less sodium Old Bay seasoning, 1/2 tsp garlic powder and a pinch ground nutmeg. Cover and cook on HIGH for 4 1/2 hours or LOW for 6 hours, 45 minutes. 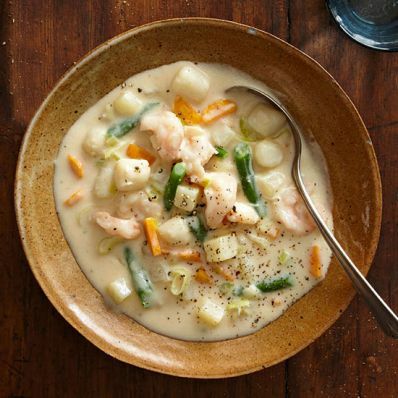 Uncover and stir in 1/2 lb trimmed green beans, cut into 1/2-inch pieces, 1/2 lb peeled, deveined shrimp, cut in half, 1/2 lb bay scallops, 1/2 lb lump crab meat or imitation crab, torn into small pieces, and 3 tbsp instant potato flakes. Cover and cook 15 minutes. Season to taste with salt and pepper. Per Serving: 330 kcal cal., 5 g Fat, total, 918 mg sodium, 44 g carb., 5 g fiber, 29 g pro.